Wonderfully rich and chocolaty cookie that is soft and moist. Smooth as velvet! First, sift the flour, cocoa powder, baking soda, and salt together in a large bowl, and set aside. Using a handheld or stand mixer with a paddle attachment, put in the butter on high speed for 1 minute, and scrape down the sides and the bottom of the bowl as needed. Lower the speed to medium and incorporate the brown and granulated sugar until combined. Next, add the egg, milk, and vanilla extract, scraping down the sides and bottom of the bowl as needed. Once mixed, add the food coloring and beat until combined. Turn off the mixer and add the dry ingredients into the wet ingredients. On low speed slowly beat until a very soft dough is formed. 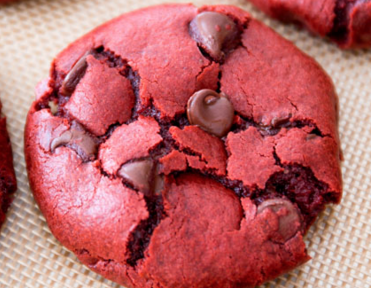 Add more food coloring if you’d like a dark red color. Continuing at low speed, add the chocolate chips. You’ll want a sticky consistency. Next, allow the dough to chill for an hour or up to 4 to 5 days. Ensure that the dough is covered with foil or plastic wrap. If you plan on chilling for more than 24 hours, ensure that the dough sits at room temp for 45 minutes. Preheat oven to 350°F degrees, and line two large baking sheets with parchment paper or silicone baking mats. Scoop 1.5 tablespoons of dough and mold into a ball. Place about 9 balls onto each baking sheet. Bake each batch for 10 to 11 minutes. Simply press down on the warm cookies to slightly flatten and form crinkles. Stick a few chocolate chips on the tops of the warm cookies. Allow the cookies to cool on the cookie sheet for 5 minutes before transferring to a wire rack to cool completely. These tasty bits can be stored in an airtight container at room temperature for up to 7 days. They can also be frozen for up to 2 months. Cookie dough balls may be frozen up to 2 months. Bake for 1-2 extra minutes.